I spent two weeks in Costa Rica volunteering with sea turtles and traveling this summer and it’s a gorgeous country! From the beaches to the volcano to the cloud forest, the many micro-climates can make it seem like you’re in a different climate every day. I learned a lot about what to bring, so I put together this essential Costa Rica packing list for you so you don’t forget anything! Yes, you can buy things while you’re there, but shopping isn’t that cheap in Costa Rica. In fact, you should be prepared to pay U.S. prices for most items. So it’s best to bring everything you might need and avoid the extra hassle. An additional tip is to pack for Costa Rica with a backpack and not a roller suitcase. The ground is not always that easy to navigate and can be bumpy and rocky. You will save yourself the hassle of trying to manage a rolling suitcase if you can just carry everything you need on you. If I’ve forgotten anything, comment below! 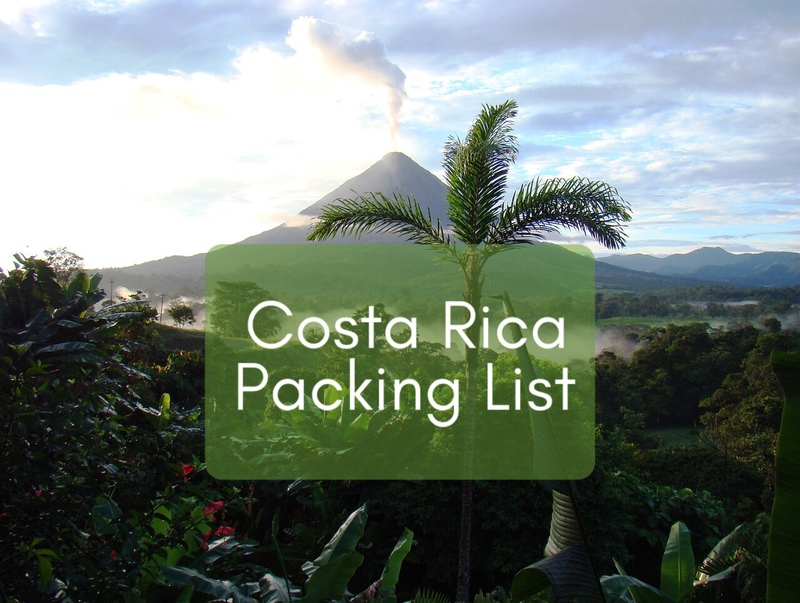 I’d love to hear your own Costa Rica packing list tips. By the way, I booked my flight using Expedia, one of my favorite travel sites! These links are affiliate links, which mean we may get a small commission if you purchase something we recommend. More info. Reef-Safe sunscreen is a perfect Costa Rica packing list item, appropriate for swimming and city days! I love Alba sunscreen; it goes on smooth and the white-ness rubs in quickly. It’s biodegradable, so you can feel good wearing it in the water. It comes in a variety of SPF and scents like green tea, tropical fruit, or fragrance-free. Biodegradable Shampoo and Conditioner will be gentle on local water systems and won’t pollute the environment if you shower outside. I like these from The Honest Company. And check out my guide on biodegradable shampoos and soaps! Mosquito Repellent will save your poor, poor skin from the swarms of biting bugs at certain times of the year. Check out this Repel with Deet version if you’re not messing around or this more natural option using essential oils by Mosquito Guard. A Quick Dry Towel is a great idea to have on hand. They pack down to the size of a soda can and dry quickly. I always pack mine from RainLeaf. Make sure you get the size large which is perfect for showers. A Head Lamp is essential if you’re staying somewhere without night time lights or if you’re camping. Opt for the kind with a red light, which is easier on night eyes. This one from Vitchelo is really bright and has both white and red light functionality. Hiking shoes or a sturdy pair of sneakers will be essential for hiking around the Arenal Volcano area and the cloud forests. I’d recommend a shoe with a lot of tread and a waterproof top in case you hit rain or slippery terrain. These Merrells come in a variety of colors and have excellent reviews. Water shoes will come in handy when you visit some of the waterfalls or beach areas with rocky bottoms. These water shoes from Aleader are breathable, have a sturdy base, and come in a bunch of cute colors like teal, peach, or lavender. Costa Rica has pure and fresh drinking water, so ditch the one use bottles and bring your own! This Kemier bottle folds up, so it saves you space when you’re not using it. It’s also made of medical grade silicone that’s BPA free. Whether it’s a baseball cap or one that has a rim all the way around, you’ll definitely need a hat to keep your face out of the sun and dry when it rains. I snagged one of these wide rim Columbia hats before my trip to protect my face and ears. Long sleeve rash guards are great for swimming, snorkeling, beaching, or as a cover up when you go into restaurants and stores. You’ll especially need one of you decide to try surfing! A mosquito net will save you from those little biters that are everywhere in Costa Rica. Invest in a large one. I made the mistake of buying a small one and couldn’t tuck it in the sides of my bed. Not cool. A rain jacket will be essential no matter what time of year you travel to Costa Rica. Even in the dry season there are still sometimes storms. Try one with zippered pockets like this Columbia Switchback jacket to make sure you keep out dampness from your pockets. This lightweight rain jacket also packs down into its own pocket! 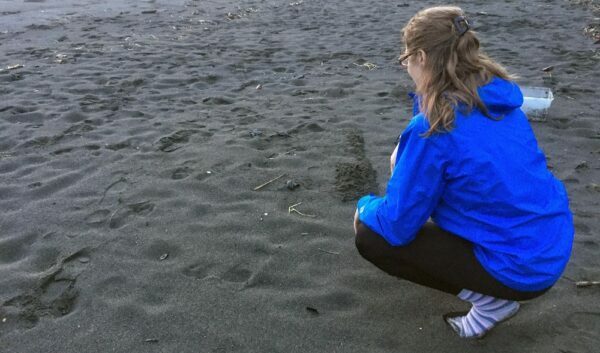 Volunteering with sea turtles in Costa Rica. My rain jacket was essential! Quick dry clothes are perfect if you’re in a wet climate. They’re also handy if you’re packing light and want to hand wash your clothes. They’ll dry overnight if you hang them. Here’s a great pair of quick dry pants from Columbia I love and quick dry athletic shirts by Opna that have almost 3,000 positive reviews! Quick dry socks will come in handy if you hand wash clothes or if you need them to dry quickly after a day of hiking. Cell phone car mount by Beam Electronics — if you’re renting a car and using your phone for GPS, invest in one of these handy mounts that clips in to your car vents! The roads are very windy and you don’t want to me looking down to check your map. In the same vein, you’ll also want to bring along a car charger and a portable cell phone charger like this Jackery charger bar. A dry pack for hiking or visiting waterfalls and rainy climates is essential. Don’t ruin your nice dry things in the rain! A travel First Aid kit – this tiny kit takes up no room at all but will prove useful if you have a scrape or two. A lightweight backpack like this Venture Pal pack will come in handy for hiking or day trips. I own two of these and love how they pack down into themselves for easy storage. You’ll want to grab a Costa Rica guide book. WiFi can be spotty and it’ll come in handy when traveling or needing a few phrases in Spanish. Cash is a necessity in any Costa Rica packing list. Lots of places in bigger cities take cards, but you’ll want to bring along some of the local currency, colones, for traveling in smaller towns. My recommendation is to use a checking account that has no international debit/ATM fees. I use Charles Schwab for this since they refund any ATM fees I incur. I hope this Costa Rica packing list will prove useful to you as you prepare for your upcoming trip! Leave a comment below with anything I might have missed or your suggestions. I’d love to hear them! If you’re looking for lodging, check out Booking.com for savings on Costa Rica hotels! And if you need help picking out a restaurant, check out my guide to restaurants in San Jose, Costa Rica.